Register now your email address and never miss events, dates and news for DELAIN. Dutch symphonic rockers DELAIN have been releasing and performing their signature catchy melodic metal sound worldwide for over a decade now. The five albums on their name include guest performances from the titans of the scene, among others: Sharon Den Adel (WITHIN TEMPTATION), Marco Hietala (NIGHTWISH), Alissa White-Gluz (ARCH ENEMY), Burton C. Bell (FEAR FACTORY). Having toured the globe with bands like NIGHTWISH, SABATON, WITHIN TEMPTATION and KAMELOT, and having rocked festivals like WACKEN, GRASPOP and FORTAROCK, DELAIN have strongly carved their niche within the scene. After touring South America, the US as well as extensive EU tours with their album THE HUMAN CONTRADICTION, their latest chart hitting full-lenght MOONBATHERS opened new doors for DELAIN as they performed their first US/CAN headline tour in the spring of 2017. The band released their first ever live DVD A Decade of Delain - Live at Paradiso - fall 2017, after which they went on their tour dubbed the "Danse Macabre Tour" featuring Marco Hietala, for which dates sold out months in advance. The band is now announcing an exciting new EP for fall 2018, in anticipation of their upcoming full studioalbum due 2019. 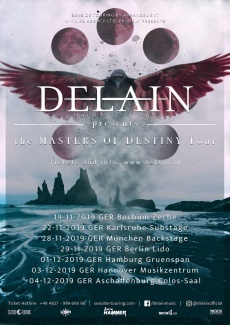 To celebrate the EP release, DELAIN will perform two intimate headline shows on the 11th and 12th of October 2018, during which fans will get a taste of the new DELAIN! Aside European festivals and a South American Tour with NIGHTWISH, these will be the only DELAIN club shows for 2018. So be there! Details of the upcoming EP are yet to be disclosed. Keep an eye on the bands socials and website to be the first to know!